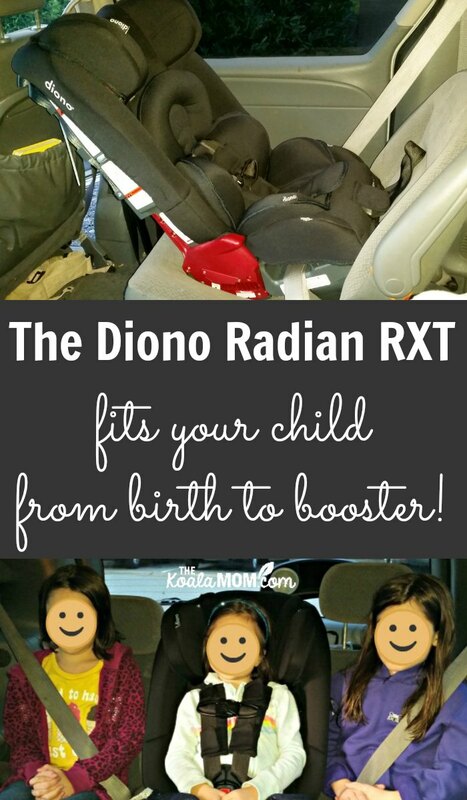 The Diono Radian RXT car seat fits your child from birth to booster! The arrival of baby number five in our family means that our minivan is full. My husband and I spent a lot of time discussing car seats and how to fit our kids into the van in the safest, most comfortable manner. As I researched possible options, one name that kept coming up was the Diono Radian. We actually dropped by our local kids’ store to check out car seats. My husband liked the Diono because of its steel frame and ten-year lifetime. I liked it for its narrow size and memory foam cushion. I was super excited when Diono agreed to let us try out the Radian RXT All-In-One Convertible Car Seat . Here, I want to show you how it fits three of our kids and how it can grow with your child from infant to tween! I was eight and a half months pregnant when our car seat arrived at the shipping depot. The delivery guy took one look at me and offered to carry the box out to my van. I happily agreed (there are some perks to pregnancy!). At home, I decided to leave the car seat in the back of the van until my husband could help install it. I’m usually the one to adjust car seats in our van, but I didn’t feel like moving it around myself. I’m glad I waited. Did I mention the Diono Radian has a full steel frame? That means it’s heavy. This is not a car seat you are going to toss around a vehicle with one hand. When we unpacked the Radian RXT from its box, all the girls wanted to check it out. They each tried sitting in it (in our living room) and then began arguing over who got it in the van. Yes, even my 9-year-old, who has been in a booster seat for several years, wanted this car seat. With the memory foam cushion, I could understand. It’s much comfier than any of our other car seats or boosters. I really like the extra infant supports that come with the Diono. The body support makes the car seat a bit narrower and ensures your baby won’t slouch sideways while sitting in his car seat. The head support can be moved up and down as your baby grows. These supports are all memory foam, just like the cushion in the car seat itself. They just sit in the car seat, so it was easy to add them for Joey and then take them out again for the older girls. 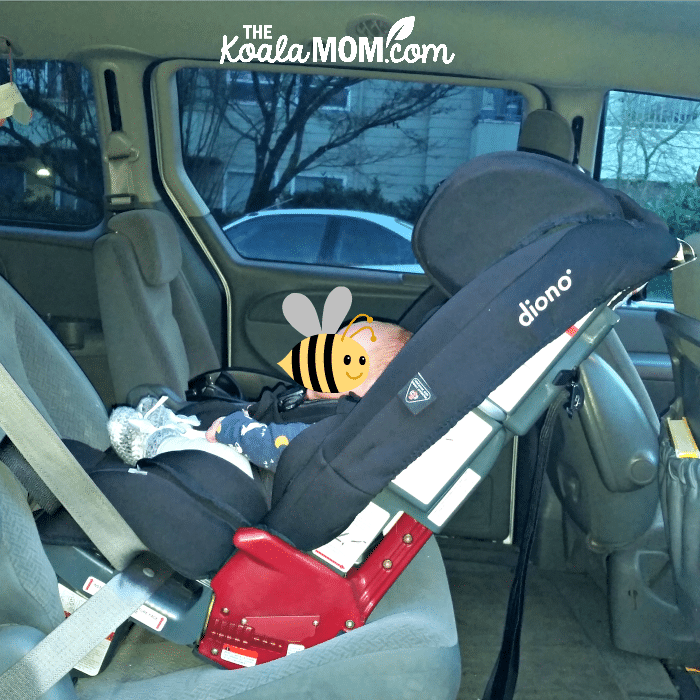 As a rear-facing car seat, the Diono does take up quite a bit of space. I had to slide the passenger seat in my mini van forward in order to fit the car seat behind it. If you have a smaller car, you’ll want to check out fit before buying the Diono. While I used the van’s seat belt to install the Diono, it also comes with a UAS tether. When you aren’t using this tether, it tucks neatly into the back of the car seat. Either way, I found it easy to install the car seat in our van for Joey. Jade (who turns 5 in a couple months and weighs 35 lbs) has been the primary user of our new car seat. For her, I have it installed in the middle of the rear seat in our minivan. The lower UAS hooks in our van are in the wrong place to use them, so I’m using the van’s seat belt and the top tether here. Our biggest reason for choosing the Diono Radian RXT for our minivan was that it’s the narrowest car seat on the market. Our Dodge Caravan has captain’s seats in the middle, so we needed three kids to sit in the rear seat. 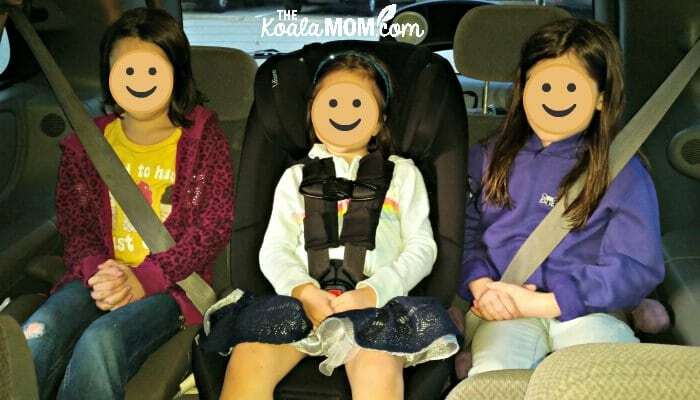 I worried this wouldn’t work, especially since my older two girls still use booster seats. 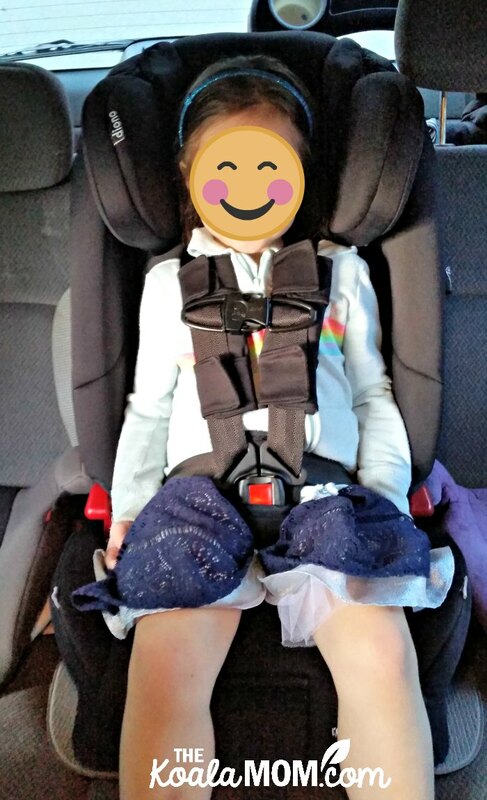 I was amazed when we put the Diono in, with a booster seat on either side, and all the girls were able to buckle up. Having the Diono in the middle provides a “buffer” between the three girls so they can’t elbow each other. It also lets both Sunshine and Lily use the shoulder restraints. When they get in, Lily helps Jade get buckled and then gets herself buckled. The Diono Radian has some extra padding around the straps and buckles. These should make the straps more comfortable, but they also make it a bit more difficult for Jade to buckle herself. I have to help her slide the padding on the shoulder straps up and down to adjust the chest clip to the right place. Finally, I love the head rest. The Radian has the best head rest of any car seat we’ve used. It’s adjustable up and down for your child (and isn’t used for the infant). Jade rarely falls asleep in the van now, but she did after one busy day. I glanced back to see her cheek resting on her head support. I actually had to double-check that she was really asleep, because she wasn’t in the usual awkward neck-bent-sideways position that kids assume when sleeping in the car. If you bought this car seat when your child was an infant, you could use it until they turned 10 and outgrew (hopefully!) a booster seat. Sunshine turns 10 this February, so she meets the age requirements to ride without a booster, but not the height requirements. 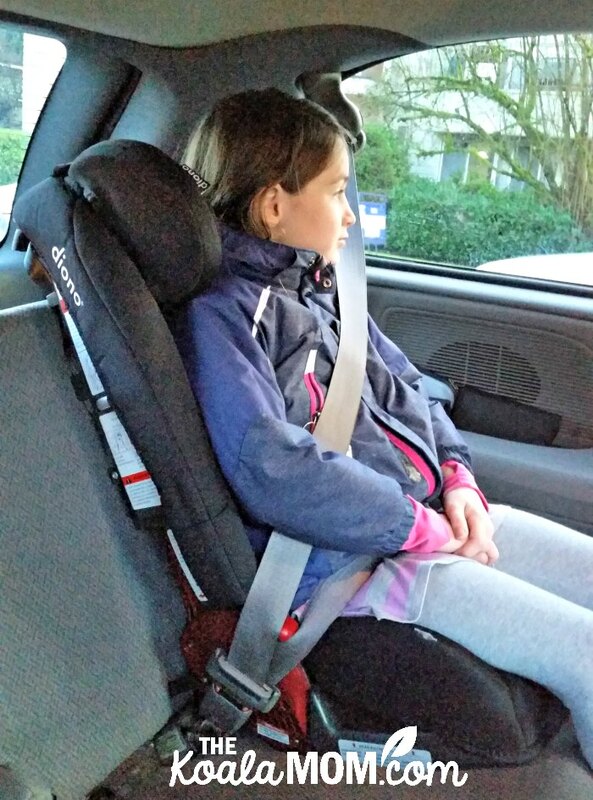 She’s 4′ 2″ tall and 55 lbs and tested out the Diono Radian as a booster seat. The head rests are at their highest position for Sunshine, so if she was much taller, she wouldn’t fit in this car seat. The Diono still offers her more support overall than a backless booster. She was able to easily buckle herself in. We could have all three girls in the back seat in Diono Radian RXTs. The Radian is narrow enough to fit three across in most vehicles. Sunshine and Lily could use it as a belt-positioning booster seat while Jade used it with the 5-point harness. Having tried out the Diono Radian with three of our kids, I wish we’d bought this car seat way back when we were first getting car seats. While it is a pricey car seat compared to others, we would have saved money in the long run by having to only buy one car seat instead of two or three. If you’re looking for a new car seat for your baby or child, I recommend checking out the Diono Radian RXT for yourself. You can learn more about Diono car seats by visiting their website. You can also find Diono on Facebook, Instagram, Pinterest and YouTube. I received the Diono Radian RXT car seat and angle adjuster for the purposes of this review; all opinions expressed are my own. This post contains affiliate links; as an Amazon Associate, I earn from qualifying purchases.